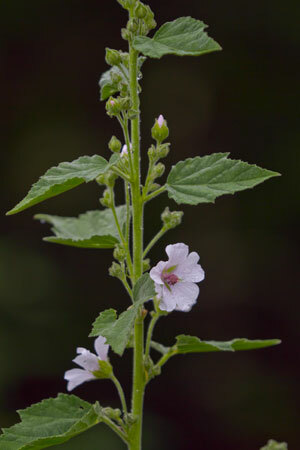 Marshmallow is one of the most valuable demulcent herbs for the gastrointestinal, respiratory and urinary tract. The roots, leaves, and flowers contain polysaccharides that yield viscous mucilage when extracted in water. This "slimy" liquid directly coats and protects mucous membranes in the digestive tract to relieve heartburn, stomach ulcers, and sore throats. Marshmallow has a mysterious indirect "reflex" action on the lungs and urinary tract. It relieves irritation in the bladder and supports other herbs that treat urinary tract infections (UTI). In the lungs, it reduces inflammation of the airways and moistens and soothes a dry cough. In addition to its demulcent effect, research shows it acts as a cough suppressant and bronchodilator. However, unlike stimulatory herbs like ephedra, the mechanism is unrelated to B-adrenergic receptors, making it appropriate for people with hypertension. Research shows polysaccharides in marshmallow stimulate tissue regeneration that helps to heal ulcers and wounds. Although not a primary antimicrobial herb, it does demonstrate some antibacterial activity against gram-positive bacteria (Staphylococcus aureus) but not gram-negative bacteria. Externally the marshmallow poultice can help drain and heal sores, boils, and abscesses.